The Witch of Willow Hall follows the story of the Montrose family as they flee to their vacation home in the quiet town of New Oldbury after finding themselves deep in scandal. In Boston, the biggest threat to the family was social exile but after settling in to their grand new home they realize that there’s more to fear than a tainted reputation. For a book that was supposed to be about a witch, there were an uncanny amount of scenes in the novel that focused on ghosts and other supernatural forces rather than on a young witch. Instead, the book easily reminds readers of The Haunting of Hill House; with supernatural beings that constantly prowl around the house and eerie rooms that make you question your sanity. 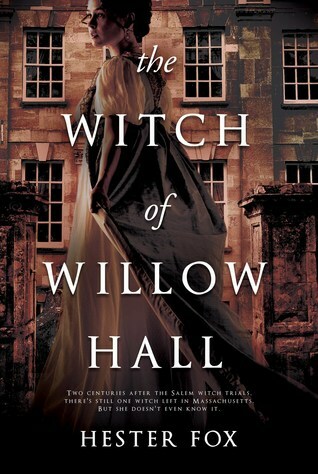 Regardless of the fact that the book focused more on the drama and secrets surrounding the family rather than on the actual Witch of Willow Hall, I thoroughly enjoyed reading each chapter. After the family moves to New Oldbury, the three Montrose girls are eager to get back to the life they had in Boston but, as expected of a small quiet town which is miles away from the city, it lacks any form of entertainment. However, when Mr. Barrett comes into the picture, excitement returns to the Montrose girls’ lives and they each vie for his attention. While some characters were unbearable to read about, it was easy to relate to Lydia, the protagonist. She’s calculated, a bookworm and she’s head-over-heels in love with the brooding bachelor, Mr. Barrett, who lives next door. Besides these traits, Lydia is also one of the few characters in the novel who immediately picks up on the weird vibe that the house and its surroundings give off. On the other hand, her sister, Catherine is more occupied with finding a husband. At first, Catherine comes off as a major airhead for her desperate attempts to lure Mr. Barrett and his friend to become her latest beau. As the story progresses, it becomes apparent that Catherine has more than one reason for her less than modest displays of affection. Then there’s the youngest Montrose sister, Emeline, who I found was one of the hardest to read about. Not only was her part of the story a little annoying but it was also the saddest. As the story progresses and the secrets begin to unfold, the author does a great job of developing each character. Lydia becomes fully aware of the reasons why the supernatural forces in the house refuse to leave, Emeline’s character spirals down a road that neither Lydia nor the other members of the family can save her from and Catherine’s situation takes a turn for the worse but throughout the story she still refuses to confront reality. The Witch of Willow Hall explores the lives of a dysfunctional family that is trying desperately to keep from falling apart while holding on to their secrets. It is perfect for anyone looking for a suspense novel to fill the void until a sequel of their favorite thriller novel is published.